In late August, Asher, our grandson that lives near Augusta, Georgia, was with us for almost three weeks. Asher loves to play outdoors and most of the time he was outside running through the water sprinkler, drawing chalk pictures on the patio cement, or riding his trike. 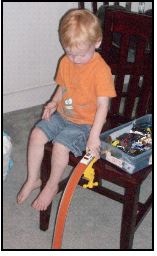 Two of his favorite indoor activities are drinking chocolate milk and playing with Hot Wheels® cars and trucks. 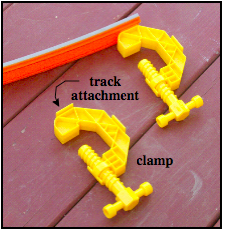 This picture shows how Asher has learned to place a car lentgthwise on the top of track, release his grip, and let gravity roll it down the track. At one time or another, all of our kids and grandkids have had a lot of fun playing with Hot Wheels®. At Asher’s age (two-plus years) the height of a chair is just right. 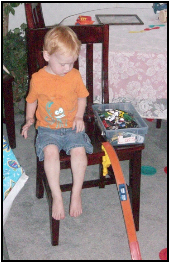 He can sit on the chair with his box of cars and trucks and let them roll, one at a time, down the track. This creates a huge pileup near the end of the track. As Asher gets older and his hand-eye coordination develops, I have a set of loops and ramps to add to the track to increase the action level. But for the next year or two, a simple setup is all he needs. Hot Wheels® are all about the force and motion concepts of displacement, speed, velocity, acceleration, mass, gravitational potential energy, kinetic energy, and force. In future posts, I will describe how kids can have fun and explore these concepts with Hot Wheels® cars and trucks. Don’t think that running cars down a track is an activity only boys like to do. Asher’s grandmother (known here as grandmothermath), taught sixth graders and every year she would organize a Hot Wheel® Derby. Each boy and girl would select a car or truck from a large supply, measure its mass, length, width, and height and then enter it in the Derby. Students would race their vehicles down a ramp made from scrap wood. Winners of each race would then compete and eventually a single class winner would have the fastest car in the class. 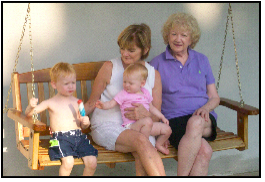 It’s late afternoon in California and to Asher there’s nothing better than a Popsicle and swinging with sister Kate, grandmother, and Kate, grandad’s sister from Oklahoma. Grandadscience looks forward to many years of toy car and truck dynamics with Asher and Kate. . . . . coooollllllllllll bro!